MKS has given some study to the Shimano SPD system to devise a clipless system of their own that is remarkably similar to the SPD system. The MXP-110 is approximately the same size as the Shimano M525, at 2.7 inches long, 1.45 inches tall, and 3.6 inches wide spindle tip to body end. The spindle and bearing assembly thread into the pedal body as a single unit. The spindle is made of forged Cro-moly steel, and hollow with a 5mm hole for 1 3/8" from the thread end. Like many other pedals being made, this pedal uses a nylon sleeve that encloses the spindle and bearing arrangement which threads into the pedal body. 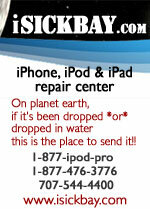 Inside the nylon sleeve are two polished steel bushing in which the spindle revolves. The spindle is highly polished in the areas of bearing/bushing contact. 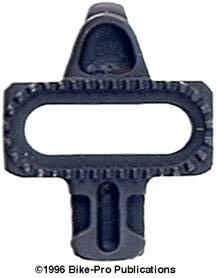 The inner bearing surface is 9.5mm long and 12mm in diameter. The outer bearing surface is 7mm long and 8mm in diameter. The reason highly polished bushing are being used is they provide a much larger surface area, with 360 degree support through the spindle revolution. At the end of the nylon sleeve, nylon washers maintain a slippery surface even though a 10mm nut cinches the assembly together. We found the MKS assembly threads into and seats with the proper spindle exposure in a Shimano M525 pedal body, so clearly there was some borrowing of thought here. 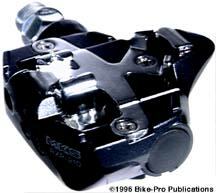 The Shimano cartridge has a larger diameter and won't fit in the MXP-110 body. The mechanics of the SPD system are revealed as you read further in this section. 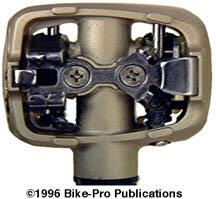 Functionally, all SPD pedals have a spring loaded rear cleat retention. 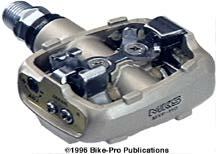 The MXP-110 pedals do not rely on a front or rear spring system, but on a spring loaded cleat retainer on the outer side of the rear of the pedal, so only lateral outward movement of the foot away from the bike, permits release. An adjusting screw at the rear of the pedal increases or decreases the tension on a flat wound spring coiled around an axis, with one of the spring ends pushing against the cleat retainer. As the adjusting screw is turned to the left, the spring becomes tighter and applies more pressure on the cleat retainer, requiring more pressure from the rider to effect a release. The other points of cleat contact are fixed in place through the use of a cleat "saddle" stamped from steel plate and a fixed toe hook plate. 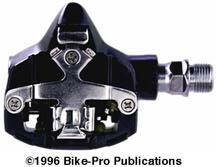 When the cleat is seated, the saddle and fixed toe plate lock the cleat in the pedal, with the cleat retainer as the only point of movement.